I am excited to start a new academic season with all of you as our leaders! I am sharing this message on our school blog and my personal blog. I wanted you to know that up front. I am continuing to do my best, as lead learner at KPS, to lead in a transparent manner. I wanted to mention a couple logistical matters and thread some of our core beliefs as I have interpreted them and cultivated them from the work that you were all doing long before I came along. First of all the school continues to look amazing. We have a historic building. It is aged with rich history. Bringing her up to snuff during the summer is hard work for our caretakers and support facility staff. Joe, Mike, Brian and Dave did excellent work this summer prepping our learning spaces. When you see them please let them know how much their hard work is appreciated. Our facility staff also did some fix ups that help tremendously. While we are moving to a new facility in the future we are more than happy and energized to keep our school looking as best it can. Likewise Lindsay has moved mountains getting us as ready as possible for the big day. She and her new partner Oliveira deserve much thanks too. Classrooms and learning spaces look great and are prepared because of the work you have done over the last two weeks. Thanks for dedicating your time in order to make our school awesome. 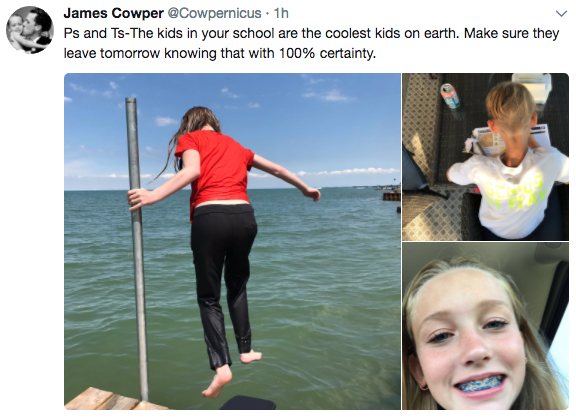 It is our combined goal to have every single student leave tomorrow knowing with 100% surety that this will be the best year ever, that they mean the world to us and that they are welcome, encouraged, cherished and respected as learners and KPS community members. If you find that there is a student that needs lifting up…. lift them up. Doing this shows each of them that we have their back and we have each others’. KPS leaders lead with trust. Trust our students, trust each other. Trust extended is reciprocated. All students know what classrooms they are in. Almost all students have met their teachers. Edsby has been active for two weeks so some students may have gone online to look again. If you do not have a home room please help us by making sure every child has a home base and knows that they are welcome there. Timetabling issues: if any errors arise please let Kelly know asap so we can rectify. A full cycle of days will be the litmus test of course. Our Special Education program (SERR only) will begin on Thursday morning. Please take the two days of integration to make certain that all of our students know that they belong in your rooms. Mrs. Burgess will be around on Tuesday to make certain all students are accounted for and ready to go on Thursday. Classes are tentative: reorg day is on the 15th. I will be counting kids and making adjustments along the way with your assistance. Attendance will be done on EdSby and we have back up folders just in case. KPS Agendas and a letter/package from the Principal’s office will go home on Wednesday so please use day one to send your important info home first. Please make wall space in your room for the attached items that are common references in every room: KPS timetable, KPS Safe Hands, Kind Words poster, KPS Precepts (poster coming shortly please see attachment), Lunch Time Norms, KPS TechNorms poster. Please make the time to review these items with your class on the day of school and through the week. Mr. Cowper and Mrs. Winney will visit every room to review these items a second time on day one or day two. Our Website is updated regularly for parents reference. We are using EdSby as our primary communication tool. All school events will be posted on the EdSby calendar for the community to see. You too can post news items on the main KPS page. We will continue this discussion at our first Staff learning session. We have made every effort to get the 98% of our families with email on EdSby. We will ask you to use EdSby to access school announcements and share the pertinent information with your class. Using students to do this work is ideal. Make it a classroom job. All are found at bit.ly/KPSannouncements. We will welcome the students each morning, stand for our national anthem and remind you to check announcements on your classroom devices. We will review this process moving forward. Furniture and texts: See Kelly or I if needed. Materials: If you are short learning materials please let Lindz know and we will get them to you asap. Our Precepts hang outside for all to reference. Thank you staff and students for helping create them. There is much to discuss and work on with each other as we begin another awesome year at KPS! From math learning to Chinese visitors to our school handbook. We will be busy for sure. Tomorrow morning (or this morning depending on your schedule) Kelly and I are happy to offer you morning treats. Please enjoy some light breakfast foods in the staff room on us! Thanks for making this start-up one to remember! Our kids love our school. Our educators love our school. Our parents love our school. It isn’t a school without the kids though! Help me welcome them with enthusiasm and care tomorrow!